Horizontal stems compactly branched, with shallow roots; aerial stems erect, unbranched, 9-60 x 2 cm including the leaves. Foliage leaves 8-13 × 2 mm, closely overlapping, lanceolate to narrowly oblong-lanceolate in outline, entire, coriaceous, mid- to light green. Fertile portion not differentiated; sporophylls the same size and shape as the foliage leaves; sporangia yellow-brown, rounded-kidney shaped, 1.5-2 mm, hidden in the leaf axils at the end of the stem. 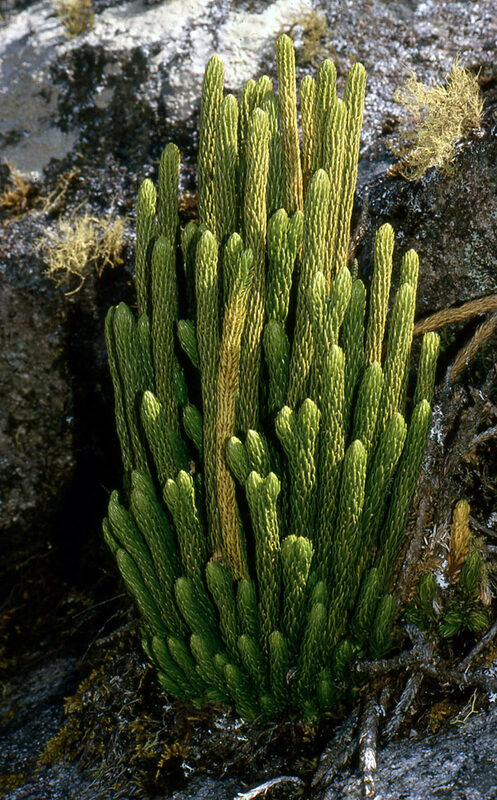 H. saururus is easily recognisable by its unbranched, erect stems that have an indistinct fertile portion; sporophylls similar to foliage leaves. saururus: lizard-like, referring to the scaly appearance of the stems. 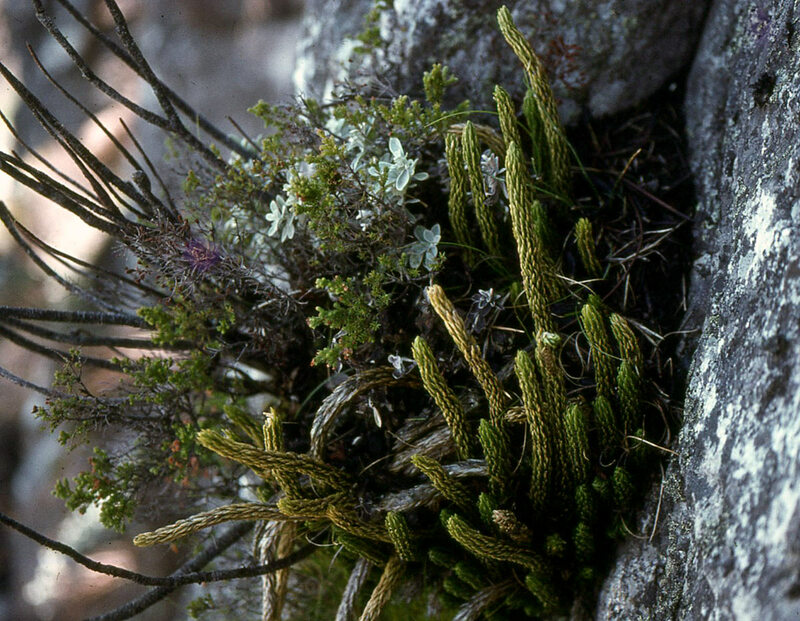 Rock crevices in montane areas, mossy, earth streambanks in montane forest, sphagnum swamps, boggy moorland, Hagenia forest. Africa, Comoros, Réunion, Mauritius, Kerguelen Isl., Tristan da Cunha and St. Helena, Madagascar and the Andes in S America. Cameroon, Dem. Republic of Congo, Ethiopia, Kenya, Lesotho, Malawi, Rwanda, South Africa, Tanzania , Uganda, Zimbabwe. Burrows, J.E. (1990) Southern African Ferns and Fern Allies. Frandsen, Sandton. Page 12. (Includes a picture). Crouch, N.R., Klopper, R.R., Burrows, J.E. & Burrows, S.M. (2011) Ferns of Southern Africa, A comprehensive guide. Struik Nature. Pages 28 - 29. (Includes a picture). Jacobsen, W.B.G. (1983) The Ferns and Fern Allies of Southern Africa. Butterworths, Durban and Pretoria. Pages 132 - 133. (Includes a picture). Schelpe, E.A.C.L.E. (1970) Pteridophyta. Flora Zambesiaca, 0 Page 17. Vercourt, B. 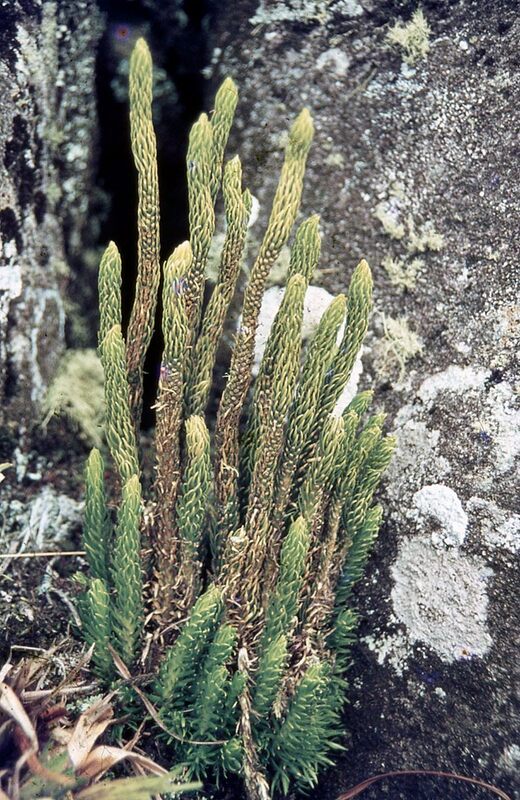 (2005) Lycopodiaceae. Flora of Tropical East Africa, Page 3.